What if there was a children’s book which came with a budding world view? What if, in giving a book this holiday season, you helped a child feel a little more connected to the planet she or he calls home? I’m pressing pause on my Gift Guide to tell you about something you shouldn’t wait until the 25th to give. There has been a disappointing dry spell in stand-out Christmas picture books in the past few years. Every December, fresh from cutting down our tree, my children squeal with delight when they unpack old favorites tucked around ornament boxes—treasured stories like Mr. Willowby’s Christmas Tree, Little Santa, Fletcher and the Snowflake Christmas, and Shall I Knit You a Hat?. New titles just haven’t brought the same magic. As promised, here is a roundup of my favorite middle-grade fiction of 2017, a mix of graphic and traditional novels, targeted at tweens or older. 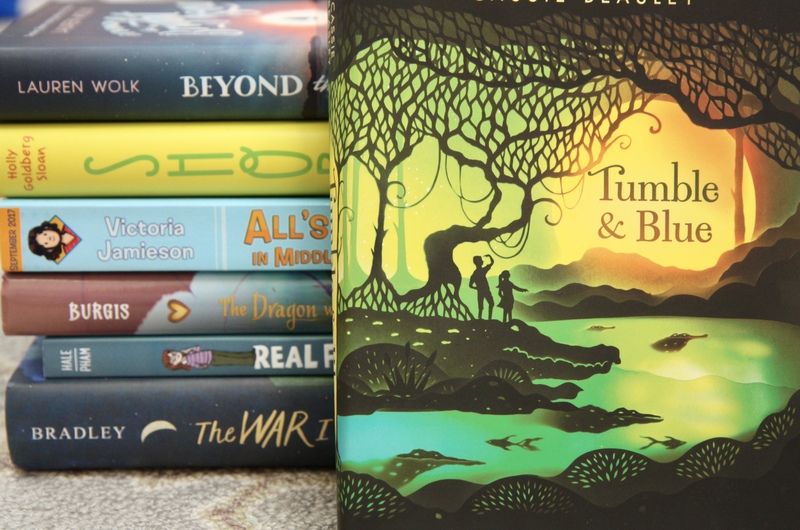 Not included are titles I blogged about earlier in the year—gems like The Inquisitor’s Tale, The Wild Robot, and See You in the Cosmos, which would make excellent additions to this list. Also not included are books I haven’t read yet—particularly Amina’s Voice, Nevermoor, The Stars Beneath Our Feet, and Scar Island (by the same author as the riveting Some Kind of Courage)—which would likely be on this list if I had. The Misadventures of the Family Fletcher, which I adore, has a sequel out this year which I’m dying to read. And I should also mention that if my son were making this list, he would undoubtedly note that it has been a stand-out year for new installments in his favorite series, including this, this, this, this, and this. These days, it’s rare that my son and daughter will gravitate towards the same picture book. Not because they don’t still enjoy picture books. Even though they read chapter books on their own—even though we’re always reading a chapter book (or two or three) together—both of my kids still adore picture books. I hope to nurture this love by leaving ever-changing baskets of picture books around the house. Long after children are reading chapter books, there is still so much to be gained from picture books, not the least of which is an introduction to a range of subjects alongside gorgeously vibrant, innovative art. How do we right a wrong? When do we speak out? At what cost to us? The holidays are rapidly approaching (how? why? help! ), so it’s time for me to deliver a series of posts with my favorite books of 2017, none of which I’ve mentioned previously. That’s right, I’ve saved the best for last. Posts will come out every few days and will target a range of ages (including a meaty list of new middle-grade reads for your tweens). My son and my mother were leaning out over the Hudson River, craning to see the iconic green statue, on our recent trip to New York City to visit Grandma. You are currently browsing the Published in 2017 category at What to Read to Your Kids.